I truly enjoyed reading this book. I hope there will be another book in the series. It was a great book. It kept my attention. I have enjoyed reading the series and already hope another one will be out. 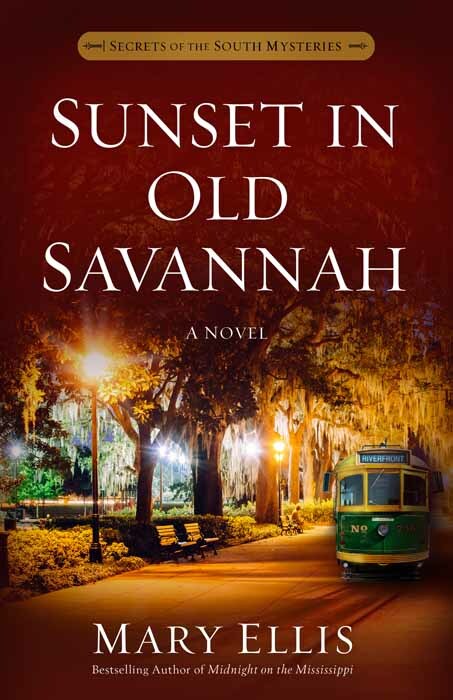 Mary Ellis’ new novel Sunset in Old Savannah, from bestselling author of Midnight on the Mississippi, takes you to places I only dream of visiting. From the streets of Natchez to Old Savannah with the feeling of being on a beach with shrimp boats and sand for miles in both directions. Mary has you thinking of who could have done the killing as well as why is this lady being nice. Is she really that blind to her husband and his wicked ways? Does she not care that some might want her dead along with her husband? Or did the wife really kill her husband and this is all an act? You will have to read the book to find out. This is book #4 in Secrets of the South Mysteries. I’ve enjoyed them all, but this one is my favorite so far. And the good news is, you really don’t need to read these in order. They do fine as standalone books. While all the characters in this series have been people with faults and backgrounds, warts and scars, this one stuck out to me. Mary Ellis, through a fun read of who-done-it that kept me guessing to the end, shows the workings of grace in this novel. It’s not slap-you-in-the-head-with-the-Bible preachy, not even close, but it’s touching and heart-warming. Well worth reading. Pick up a copy! Good things come to those who wait. Isn’t that how the saying goes? All I know is that I’ve been waiting for the next book in Mary Ellis’ Secrets of the South Mysteries and have been rewarded with another superb story. Mary Ellis has expertly combined mystery, suspense, romance, and humor. Her characters are lovable and witty, her plot is fast-moving, and her descriptions make me want to visit Savannah as soon as possible. Don’t miss this next installment in the series, and don’t worry if you haven’t yet read the first three books. You will be able to follow the story just fine. But what are you waiting for? All four novels are must reads! Mary Ellis has a real gift for creating sympathetic characters the reader can’t help but root for. As I’ve said before, the only bad thing about finishing one of her books is waiting for the next one, but fortunately, Ms. Ellis is a prolific author. I can’t wait to see what her PI’s do next! Although I have had the pleasure of reading all three of the previous novels in this Secrets of the South Mysteries series by author Mary Ellis, this novel (#4) is my favorite. Compelling drama, action, romance, twists and turns for the likable protagonists made it hard to put down. The writer has a great way with words. Her characters, even the bad guys, all come to life. I appreciate her willingness to research the area she places her story in so it feels and reads more accurately. That attention to detail keeps the plot running smoothly to a plausible conclusion (one I had not fully guessed). I enjoy her veiled references to the previous novel; without rehashing all of those stories fully, you get a better understanding of how the characters have grown. Kudos for including book discussion questions in the back! I recommend Mary Ellis books to others frequently. The only difficulty with ending a Mary Ellis book is that the reader has to wait for the next one! Mary Ellis has another AWESOME book. If you have not read the first books in this series it does not matter because you will be able to follow along. I was hooked on the very first page. Once you are really into this book you will want to climb right in and be one of the characters. After reading it I so want to go to Georgia. It sounds wonderful. You will love the characters. Mary has a wonderful imagination. I thought I had it figured out a couple of times but Mary keeps you on your toes. Pick up this book, or even better the whole series. You will not be sorry. If it was possible I would give this book at least 9 stars.